2. The alternative to this view is the customary practice (Arabic: ‘urf) of a particular land as to what defines a journey. In some countries, the custom maybe less than 80 kilometres, whereas in other countries it may be much more than that. (Ibn Taymiyyah, Ibn ‘Uthaimeen, Al-Albāni, Muwaffaqud-Deen Ibn Qudāmah) People of some lands regard travel out of the home-city to be a journey, and others see exiting the region to be a journey. The point being, that a journey is what the people call a journey, and regard it to be such. (Al-Albāni) This position neither fixes a distance nor a time period and is a strong position that is given a distinct heading at the end of this article (See Part Ten). It is strongly advised that you read it. 7. It is the Sunnah for the traveller to shorten all the four-rak’ah prayers to two rak’ahs. Additionally, he is allowed to combine between Dhuhr and ‘Asr, and between Maghrib and ‘Ishā. Fajr must be prayed at its correct time. Maghrib remains as three rak’ahs. 9. Once a traveller reaches his destination and has the intention to stay there for a fixed time that exceeds four days, then he no longer shortens or combines his prayers. Rather he prays just as a resident prays (full prayers), even though he is not in his hometown. (Al-Fawzān, Ibn Bāz) However, the saying that there is no limit to how long a person is a traveller is a very compelling position supported by proofs. See Part 10 below from Ibn ‘Uthaimeen. 11. If a traveller reaches his destination and does not know how long he will stay because his return home is connected to him accomplishing his purpose of travel, then he is to shorten for as long as he is there, even if that amounts to months or years. And he is allowed to combine. (Ibn Bāz, Al-Fawzān) This is a situation where someone travels for medical treatment or trade, etc., so his intention is to return when he has finished from his need, whether it be a week or a year. 13. A traveller who arrives back to his hometown is not allowed to shorten his prayers once inside the town limits because he is no longer a traveller. This is the case even if he was travelling (for example) during Dhuhr, and entered his hometown before ‘Asr. In this case, he must pray four rak’ahs for Dhuhr. 14. There are no Sunnah prayers to be prayed alongside the obligatory shortened prayers except for the two before Fajr, and the Witr prayer in the night. The majority of the scholars hold that the shortening of the prayer whilst on a journey is an established and preferred Sunnah, it is better and more virtuous, but not an obligation. This was the saying of Mālik (d. 179H), Shāfi’ee (d. 204H) and Ahmad (d. 241H). This is due to saying of Allah, “There is no blame upon you for shortening the prayer.” Ash-Shāfi’ee said, “The words, ‘There is no blame upon you’ is not used except in terms of allowance (not obligation) as in saying of Allah, ‘There is no blame on you if you seek the favour of your Lord.’ (2:198) And His saying, ‘There is no blame on you if you divorce your wives.’ (2:236)” They also utilise the hadeeth of Ya’lā Ibn Umayyah cited above wherein the Prophet (ﷺ) said, “It is a charity that Allah has bestowed upon you, so accept His charity.” The scholars are agreed (Ijmā’) that when a traveller prays behind a resident who leads the prayer with four rak’ahs, then the traveller also prays four rak’ahs behind him and not two. As for the distance before one can shorten, Ash-Shawkāni makes the point, “The ruling upon the least distance before one can shorten the prayers also applies to what is more than that.” More on the distances later in this article. The scholars have stated, “If a leader of a troop leaves out searching for the enemy but he does not know where he will find them (i.e. he doesn’t know his destination). In this case, they continue to pray the full prayer (without shortening) whilst they are travelling away from their residence, even if that lasts a long time. However, on their return back home they shorten their prayers, even if the journey lasts a long time.”  That is because, on their return, they have a destination in mind. And this was not the case when they left out. Abdullah Ibn ‘Abbās (radiyallahu ‘anhumā) said, “Allah’s Messenger combined Dhuhr and ‘Asr, and also Maghrib and ‘Ishā (while resident in Madinah) — and we were not in fear (of attack) and it was not raining.” In a narration, he said, “And we were not in fear (of attack) and were not on a journey.” When Ibn ‘Abbās was asked about that, he replied, “He did not want hardship for his Ummah.”  This hadeeth is a proof used by the scholars to allow combining of the prayers in times of need such as rain and other adverse weather conditions, and also whilst travelling. Umar Ibn Al-Khattāb asked the Prophet(ﷺ), “Why should we shorten the prayer whilst we are in a state of safety?” The Prophet (ﷺ) responded, “It is a charity from Allah that He granted upon you, so accept from Allah His charity.” (Reported by Muslim). The Prophet would shorten the prayer on all his travels even in a state of security and safety. This ease and allowance continues for this Ummah until the Day of Resurrection. The reason is that a journey brings about hardship in most cases and there occurs in a hadeeth that it is a portion of punishment. And there is a narration that states, “Indeed Allah loves that His allowances are taken just as He hates that His commands are disobeyed.” There is also a hadeeth of Ā’ishah (in Bukhāri and Muslim) which states that in the beginning the prayer was prescribed as two rak’ahs each, and it remained as such for the traveller, except for the Maghrib prayer, and it was increased for the resident. The journey that is permissible is one that is not sinful – on this journey, one shortens the prayers. Visiting shrines of “saints” and other innovations, or for stealing, drinking, fornicating, etc. then on these types of travels, it is not allowed to shorten the prayer because they are journeys of disobedience to Allah. 1. The journey must be permissible such as trade or visiting family members, or for Hajj, Umrah, etc. 2. The length of the journey is the distance travelled over two days or more, from the start of the one’s journey to the intended destination, i.e. 80km. 3. The shortening of the prayers begins from the time the traveller leaves behind him the dwellings of his town, or the tents of his tribe if he is from the Bedouins or desert-dwellers. If a traveller has to make up a prayer (qadā) that was mandatory upon whilst travelling, and he has now returned home, then he must pray it in full. And if a prayer time has started, and the person does not pray it until he has embarked upon his journey, then he must pray it in full, not shortened. 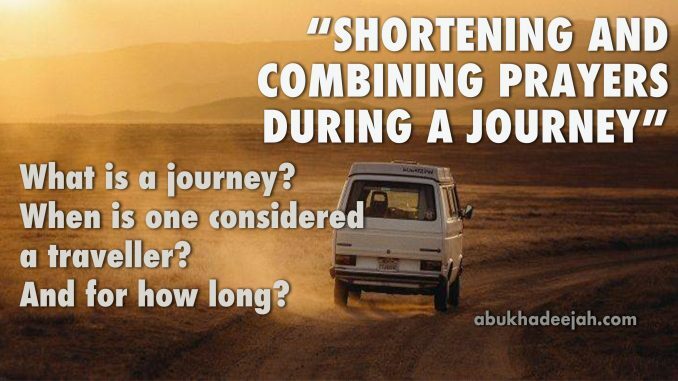 Part Six: For What Length Of Time Can A Person Shorten The Prayer? If a person intends to stay in a place until he fulfils the purpose of his visit, but he does not know not know how long it will take (i.e. it could be a short or a long time), then such a person continues to shorten the prayer until he achieves what he came for, and then returns home. This one shortens for the whole period of his stay. So a person travels to a land for the fulfilment of a need, but he does not know how long it will take, or he falls sick, or he is held back due to heavy rainfall, or snowy and icy conditions, or due to enemy attack, or if he is imprisoned unjustly — then this person continues to shorten his prayers even if he is there for years, until he returns home. If a person is held in custody or imprisoned justly due to a crime, then he is to pray full prayers and not shorten. That is because his imprisonment is just, known and normally has a time period connected to it. Combining the prayers are allowed: 1. For Dhuhr and ‘Asr. 2. For Maghrib and ‘Ishā. As for Fajr, it is prayed on its own. Combining the prayers are considered to be mubāh (allowable) and not a Sunnah (recommended). Combining is allowed for a purpose, either: 1. When one is on a journey. 2. Due to an illness (which includes the prolonged bleeding of a woman, or the continual uncontrollable discharge from the private parts of a man or woman). 3. In the case of rain, snow, bad weather, or another pressing need. Shaikh Ibn Bāz stated, “The majority of the scholars of the scholars have specified a journey to be a day and night of travelling by camel or a steady walk. And that approximates to 80km. That is because this is the distance that is considered a journey in the customary practice of the people (‘urf). And less than that is not a journey. Ibn ‘Uthaymeen was asked regarding the distance one needs to travel on a journey which requires one to shorten the prayers and whether it is permitted to combine instead of shortening the prayers. He answered, “The distance at which some of the scholars stated as a limit at which one can shorten the prayer is approximately 83km. Other scholars have considered the customary practice of the people (of a land) to be the measure which decides a journey even if that does not extend to 80km. And that which the people (of a land) state regarding a travel, “It is not a journey” then it is not a journey even if it reaches a 100km. And this was the preference of Shaikhul-Islam Ibn Taymiyyah (rahimahullah). That is because Allah (the Most High) and His Messenger (ﷺ) did not specify a particular distance at which one is permitted to shorten the prayers. Anas Ibn Mālik (may Allah be pleased with him) said, “Allah’s Messenger (ﷺ) would shorten the prayer to two rak’ahs at a distance of three miles or three farsakhs.”  The saying of Ibn Taymiyyah (may Allah’s mercy be upon him) is the closest to what is correct. A journey is every type of travel where a person leaves his land – and he stays away for as long as he wishes. A journey is that which is limited to a specified distance, beyond which one is regarded as a traveller. A journey is that which the custom of a land (i.e. its people) regard to be a journey, ‘Urf in Arabic. Since we have already discussed the position of those scholars who hold that a journey that allows shortening of the prayers (and other allowances) is limited by distance travelled and length of stay, then here we shall discuss the third saying of the scholars, i.e. the ‘Urf of a people. Firstly: Shortening the prayer for the traveller is a confirmed Sunnah (mu’akkadah) and to pray the full prayers on a journey is disliked (makrooh). Thirdly: The saying that a journey is defined by the normal practice of a people (‘urf) is the preferred position of Ibn Taymiyyah (Majmoo’ Al-Fatawa (24/135), Al-Muwaffaqud-Deen Ibn Qudāmah (Al-Mughni 2/152) and a group of other scholars. So whatever is known and called a journey by the people is a journey by definition. These scholars argue that to limit a journey to a specified distant requires specific proof, and there is no proof. Following from that: It is possible that a short distance is a journey if it takes a long time. For example, it is conceivable that we can leave from one place to another and it is a journey due to the distance travelled and the length of time one stays. So if we travelled to the town of Buraydah (38 km from ‘Unayzah), and we stayed there a day or two days, then we are travellers. But if we returned the same day, we are not travellers. That is because the distance is short, and the time spent there is small. However, if the distance was far and the time spent was small, then it is a journey. So, if we travelled to Riyadh by aeroplane (351 km from ‘Unayzah and 55 minutes by flight), and we returned the same day, then this is a journey — this is due to the fact the distance was far. So this now becomes a journey defined by custom and practice (‘urf). Therefore a journey can be called a journey (where a person shortens his prayers) even though the distance travelled is small if the time spent on the journey is long. And a journey can be called a journey (where a person shortens his prayers) when the distance travelled is far even though it did not take a long time. This viewpoint from the aspect of reason and insight sits comfortably with one’s soul. Thirdly: Does a person’s journey come to an end when he intends to remain at his destination alongside the fact that his intention of being a traveller remains? In this too the scholars have differed. Some of them said, “Wherever he intends to remain for four days or more, then his journey comes to an end and he must pray the full prayers. And he can no longer take the allowances and ease of a journey.” An-Nawawi (rahimahullah) mentioned in Al-Majmoo’ Sharhul-Muhadhdhab (4/321) over twenty sayings, each one conflicting with the other — and not one of them has a clear proof that brings tranquillity to the heart and upon which one can make a firm ruling. For this reason, we return to the origin of the affair, and that is: A traveller remains a traveller so long as he does not intend to settle in a place, or remain there indefinitely. “To settle in place” means that he leaves one lands for another land to live there permanently. “To remain there indefinitely” means he departs from his land and intends to stay in the new land indefinitely, and when he finds a suitable opportunity he will return to his land or to he will go to another land. So these two affairs stop him from being considered a traveller and taking the allowances and ease of a traveller. If his journey is interrupted by a specific event such as work, or some days (of rest), then his being considered as a traveller does not come to an end. For example, a businessman stops in a land to purchase some goods or to sell some goods, but he does not know whether he will be purchasing (or selling) goods for a day or two days, or three days, or a month, two months, a year or two years — such a person takes the ruling of a traveller. A person who leaves out on a journey to work (to another land or city), and he knows the exact length of his time away. For example, a person comes to a land to attend a conference (or a course) that lasts for three months, then such a person is considered a traveller who shortens his prayers because his journey has not come to an end. Another example is a sick person who travels to a hospital (away from his land or city). He does not know when he will be fit enough to return, then it is allowed for him to shorten his prayers, even if he remains there for years on end. This is the position of the Hanbali scholars — and some of them reported ijmā’ (consensus) on the matter: That so long as a person remains on a journey that is restricted by a need that one has come to fulfil, he shorten his prayers until he returns to his land. The issue of a journey being restricted (upon a person) by a time constraint is a matter of differing among the scholars. However, it is not necessary to dispute concerning this issue because he is just like the first example of the person who is constrained to remain at his destination due to work or a need (i.e. the businessman), or the second one who is constrained to remain at his destination due to the length of time (i.e. the three-month conference). Neither of them intended to discontinue their journey. So one was restricted from returning home due to completion of work (i.e. the businessman) and the other was restricted from returning home due to completion of a time period (i.e. three-month conference). There is no difference between the two — both are travellers. Added to that: If a man intends to stay in place for four days, and another man intended to stay in a place for four days and ten minutes — so would we expect the first to shorten his prayers because he is a traveller but the second is not a traveller just because of the difference in their remaining at a destination is ten minutes?! How can that be?! Therefore, that which the evidence points to, which leaves no discomfort in the soul is: So long as a person does not intend to stay in a place indefinitely or that he does not settle in a place to live permanently, then he is a traveller regardless if his remaining in a destination is due to a time restraint (as in the example of the person who attended a conference for three months) or whether his remaining in a destination is due to a need he wishes to fulfill (like the example of the businessman or the hospital patient). There is no difference between the two situations as far as the rulings of a traveller are concerned. Fourthly: What is the reply to those who say that it is authentically reported that the Prophet (ﷺ) remained in Makkah for four days and that he only shortened his prayers for those four days? Then this hadeeth is actually a proof against those who use it to show that one can only shorten for four days once they have reached their destination. That is because the Messenger’s (ﷺ) arrival in Makkah on the 4th Dul-Hijjah was not something planned. The Prophet (ﷺ) knew that there were many other Muslims who had arrived to perform Hajj well before the 4th of Dhul-Hijjah. The season of Hajj begins from the 1st of Shawwāl and Allah has stated, “[Preparation for] Hajj is in the well-known months.” (2:197) And we know therefore that most pilgrims arrive before the 4th of Dhil-Hijjah. So did the Prophet (ﷺ) say to those who arrived before that they are to pray their prayers in full? If praying the prayers in full was an obligation then it would have been necessary for the Prophet (ﷺ) to convey that to them. So since he did not command them, then we can understand that the matter is not restrictive but open. So this hadeeth does not support the position of those who limit shortening of prayers to four days only, rather it is against them. Also, it is known that the Prophet (ﷺ) stayed in Makkah for ten days as is proven by the hadeeth of Anas Ibn Mālik (radiyallahu ‘anhu) when he was asked how long they remained in Makkah in the year of the Farewell Hajj, he replied, “We stayed there for ten days.” (Bukhari, 1081 and Muslim, 694). They arrived on the 4th of Dhul-Hijjah and left for Madinah on the 14th Dhul-Hijjah. It is proven also that the Prophet (ﷺ) stayed in Makkah for ten days at the Farewell Hajj. He stayed in Tabook for twenty days shortening the prayers (Abu Dawood, 1235). He stayed in Makkah for nineteen days in the year of the conquest shortening the prayers. So he stayed in different places for different lengths of times and he would always shorten the prayer. So it is not for us to restrict that which Allah has left unrestricted, because the religion is ease and the spirit of the religion calls for ease and expanse for the worshippers — and it is not permitted for anyone to prohibit a person from that which Allah has allowed. That which has been stated is the closest to the proofs and free from blind following and hardship upon the worshippers, It is the position of Ibn Taymiyyah (Majmoo’ Al-Fatawa 24/7, 15, 42, 44, 136, 141), Ibn Al-Qayyim (Zād al-Ma’ād 1/448) and Abdur-Rahmān As-Sa’dee (rahimahumullah). All of them stating that there is no proof to restrict the length of time one can shorten the prayers whilst travelling. Question 1: A man who leaves out to shepherd his camels, is he a traveller? Answer: He is a traveller because his heart is connected to his hometown and he knows that he has only left out for the welfare of his camels. Question 2: What is the affair of the migrants who come here to work? Answer: Those who are staying here, I think that they have the utmost desire to obtain a permit that allows them to stay indefinitely. So I would be very wary to say to them that you are travellers. They renew their permit to remain continually, and they would love to be given citizenship. So I cannot issue a verdict and say they are travellers. So I say they should pray the complete prayers, and it is not permitted for them to shorten. This also applies to the ambassadors. The origin is that they are resident in their respective embassies unless they are limited by time. See Al-Ijmā’ (p.9), Marātib Al-Ijmā’ (p.25), Al-Majmoo’ (4/209). Ibn Qudāmah in Al-Mughni, 3/104-105. Sharh Fathul-Qadeer (2/28), Al-Majmoo of An-Nawawi (4/216), Al-Mughni (3/110), Al-Qawāneen Al-Fiqhiyyah (p.59). [15b] Notes on Al-Ifsāh 2/70. References for parts 4 to 7: “Kitāb Akhsar Al-Mukhtasarāt fil-Fiqhi ‘Alā Madhhab Al-Imām Ahmad Ibn Hanbal” by Imām Muhammad Ibn Badr Ad-Deen Ibn Balbān Al-Hanbali (d. 1083H) with notes by Imām Abdul-Qādir Ibn Badrān Ad-Dimashqi (d. 1346H), and the recorded explanation of Al-Allāmah Sālih Al-Fawzān. Fatawa of the Lajnah 8/109. Fatawa Arkān Al-Islām, p. 381. Just a question. If I combine Dhuhr and ‘Asr, what about the Adhkaar after Dhuhr? Can I recite them with ‘Asr?